LONGYEARBYEN, Norway — As governor of Norway’s northernmost territory, Odd Olsen Ingero commands a police force with just six officers and a single detention cell for an area twice the size of New Jersey. Even that is overkill: Nobody has been locked up here in the capital of Svalbard since last summer. And that was for just two days. It is not just that there are not many people — fewer than 3,000 are officially registered as residents — or that what are elsewhere run-of-the-mill crimes like car theft are an exotic and very risky business in a place where there are no roads out of town to escape on. Although governed by Norway, a country that prides itself on offering cradle-to-grave state support for its needy citizens, Svalbard, an archipelago of islands in the high Arctic, embraces a model that is closer to the vision of Ayn Rand than the Scandinavian norm of generous welfare protection. 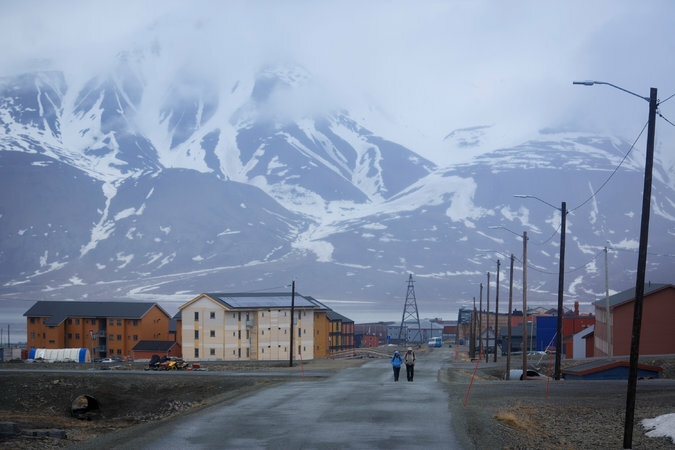 Even Longyearbyen’s socialist mayor, Christin Kristoffersen, a member of the Labour Party, wants the town — named after an American industrialist, John Munro Longyear, who founded it in 1906 — to stay off limits to all but the able-bodied and gainfully employed. This entry was posted in History, Jim Caldwell, Photography, Redondo, Travel and tagged Christin Kristoffersen, editor Icepeople Mark Sabbatini, Eirik Palm editor Svalbardposten, jim caldwell redondo beach, Longyearbyen Norway named after John Munro Longyear, Longyearbyen Svalbard, Mark Sabbatini, No homelessness in Svalbard, No unemployment is Svalbard, Norway, Salvbard, Svalbard, Svalbard 3000 full time residents, Svalbard Ayn Rand, Svalbard Governor Odd Olsen Ingero, Svalbard gun ownership mandatory, Svalbard no crime, Svalbard no retirees, Svalbard no welfare, Svalbard Norway, Svalbard Polar bears, Svalbard unemployment is in effect illegal. Bookmark the permalink.